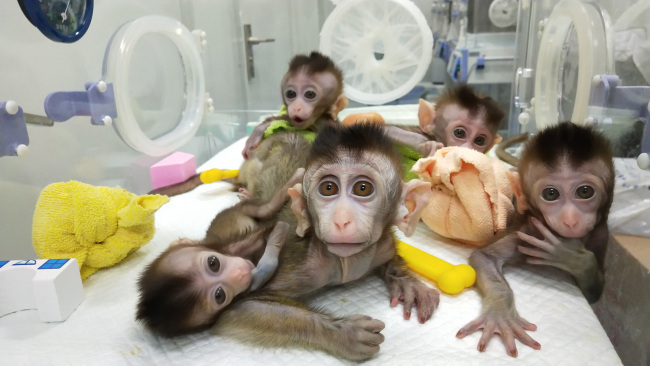 The first five monkey clones made from a gene-edited parent with biological rhythm problems－known as circadian rhythms－were born during the last six months in Shanghai. Subsequent observations could result in help for humans with similar disorders. Mu-ming Poo, an academician at the Chinese Academy of Sciences and the director of its Institute of Neuroscience in Shanghai, said the studies showed that China had mastered the capability of producing a population of customized gene-edited macaques with uniform genetic background that would advance biomedical research and the promote the discovery of new drugs. The research will also help reduce the quantity of macaques used in biological research around the world, Poo said. "Without the interference of diverse genetic backgrounds, a much smaller number of cloned monkeys carrying disease phenotypes may be sufficient for preclinical tests of the efficacy of therapeutics," he said. The donor monkey, despite the presence of the BMAL1 gene, had exhibited circadian disorders－which in humans can lead to other diseases, including sleep disorders, diabetic mellitus, cancer and neurodegenerative disorders such as Alzheimer's disease. The experiment may bring insights into the study of the disease and the invention of therapeutic treatments, according to project researchers at the CAS neuroscience institute. The new monkeys have shown a wide range of negative behavior including reduced sleep, elevated nighttime locomotive activities and dampened cycling of blood hormones. They also exhibit elevated anxiety, depression and schizophrenia-like behaviors. The experiment paves the way for the study of circadian disorder-related conditions in humans, according to Hung-chun Chang, the leader of the research. Two articles about the studies were to be published by China-based international journal National Science Review on Thursday. An increasing number of people are suffering from circadian disorders in modern society, with frequent overtime work, staying up late and traveling across time zones. The researchers said people without a regular daily schedule are prone to problems in their mental health and interpersonal relations. Most studies on circadian rhythm disorders so far have been conduced on mice, which are not the best animal model because mice are nocturnal and their brain structures and functions are unlike humans, the researchers said. "The cloned monkeys solved the problems of the long breeding cycle and small number of babies born to macaques. These monkeys, with their unified genetic background, are well-suited to be animal models," Poo said. Earlier, in mid-2016, five BMAL1-edited macaques were born, all of which exhibited obvious circadian rhythm problems, such as sleep disorders. They had more activity at night and slept less than normal. One of these five became the parent of all the five clones born last year. "Gene profiling revealed abnormal expressions of most rhythmic genes, and up-regulation in the genes associated with sleep deprivation, depression and aging in the BMAL1-edited monkeys," Chang said. More important, mental problems related to circadian rhythm disorders were observed in the monkeys, which was not found in mouse models, showing one advantage of monkeys over mice. "The monkeys frequently wrapped their arms around their heads, avoided eye contact and cuddled in the corner－typical behaviors of anxiety－when humans approached them. Such symptoms are hard to detect in mice and are different from those of wild monkeys," Chang said.